High-quality forages are essential for livestock, as premium products provide the optimal amounts of energy, protein, minerals, fiber and other essential nutrients. Forage quality relies upon many factors, including climate, soil fertility and harvesting technique. Production of premium forages is extremely complex. One of the top and most widely recognized measures of forage quality is the amount of crude protein (CP) it contains. CP has a large impact on animal digestive health and productivity. This post provides some general information on CP, why it’s important and what percentages are ideal in different types of forages. What is crude protein in forages? Protein itself is an essential element of livestock nutrition, and there are many sources from which it can be derived. 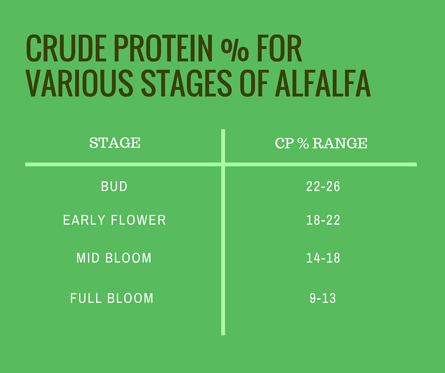 However, the term “crude protein” does not refer to or measure how much protein is present in forages. CP is a chemical analysis of the forage that calculates the amount of nitrogen (N), which is the building block for amino acids that form proteins. This is then used to estimate the amount of true protein and non-protein nitrogen. To calculate CP, total N is determined, then multiplied by 6.25 (there is 1 part N for every 6.25 parts protein in most forages). This number reflects a forage’s potential to provide protein that certain livestock require. Why is crude protein important? Proper crude protein levels are essential in forages for the many types of livestock that rely on them for nutrition. When the percentage of CP is low, the bacteria responsible for digestion cannot sustain adequate levels to process forage. Ultimately, the animal’s intake and digestibility are reduced. It is important to note that although CP is important and a commonly used measure of feed quality, it should not be used to estimate energy value. This is best represented by TDN, which we will cover in depth as we continue with the Forage Nutrition Series. 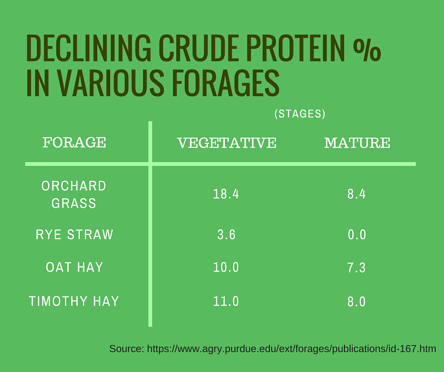 What percentage of crude protein is found in different types of forages? A look at the levels of crude protein in forage varieties demonstrates how CP diminishes as it matures. How is this percentage increased? Crude protein concentration does vary by season and maturity. Cooler environments will produce forages with higher levels of CP as compared to warmer months. Crude protein also decreases as the forage ages and fiber content increases, and in excessively rainy conditions where nitrogen is leached out after the forage has been cut. There are many fertilizer options available to increase the nitrogen available during growing. There’s a wide array of factors that impact forage quality, and crude protein is just one measurement to consider. The percentages of phosphorus, acid or neutral detergent fibers, and nitrates are other features that you should weigh when choosing high-quality forages. In the end, premium forage products are the result of operational expertise and dedication to professionalism. Visit our products pageto find the forage that is right for you and your livestock nutrition needs!